Armoured Cable vs. Unarmoured Cable: What’s The Difference? With the rapid development of optical communication, more and more fiber optic cables are increasingly used in different environments. What if under harsh conditions? Then it’s crucial to ensure your cables smooth and reliable operation when transmitting data. This is where armoured cable comes into play. An armoured cable, as its name suggests, is protected against mechanical damage, whereas an unarmoured cable not being protected. What is the difference between them? And why should we choose armoured cable over unarmoured cable? You my find answer in this post. Armoured cable has an extra layer of protection to keep it from being cut or abraded. The armor layer of coax cable is a foil wrap that is ribbed like corrugated metal to allow for flexibility, around the inside and outside of that wrap is a flooding compound to keep moisture from penetrating the cable and causing an impairment. The internal structure of 4 core armoured cable consists of many layers to prevent the cable from damage. The outer jacket provides protection against rodent, abrasion and twist, which is usually made of plastic. And the armoring materials are mainly come from kevlar, steel, and aluminum foils, aiming to protect the armored cable from being stretched during installation. Many people may think that armoured cable just has metal protection. To be precise, the armoring material doesn’t have to be metal, it can be fiber yarn, glass yarn, polyethylene etc. 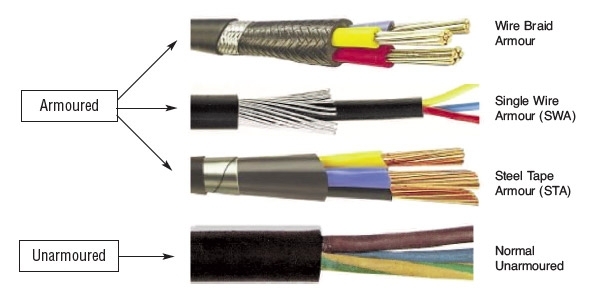 The only thing that makes armored cable different from unarmored cable is that the former has an additional outer protective layer for optical cable. The 4 core armoured cable tends to be more expensive than unarmored cable, while the armoured cable with steel strip and aluminum is much cheaper than armored fiber cable with Kevlar, which is usually used for special occasions. Armoured cable is installed in locations exposed to mechanical damage, such as on the outsides of walls, as an alternative to conduit. Armoured cable usually has a small metal ribbon to ensure electrical continuity of the safety ground. (You must run a separate ground wire in flexible conduit too; you can’t depend on the continuity of the conduit.) In HT & LT distribution, 4 core armoured cable is preferred. Inside walls and in other protected locations, less expensive unarmored electrical cable can be installed instead. Unarmoured cable is mainly used for control systems. Why Should Use Armoured Cable Over Unarmoured Cable? There are a couple of reasons that armoured cable should be used. The biggest reason is about strength, because armored cable was used more extensively in past decades when cable was simply directly buried under dirt and not used through a conduit. Nowadays most local municipalities require conduits to be trenched in prior to installing network components, thus eliminating the need for unarmored cable in most applications. Secondly, rodents or animals can and will chew through cables so the armor protects the cables from damage by animal or shoveling in direct bury applications. Thirdly, the most uncommon reason it would be used is in an RF environment that has an off air RF signal that is powerful enough to interfere with your network, the armor when grounded can provide another layer of RF protection. Armoured cable can be regarded as a kind of strengthened cable, which is harder and stronger than standard optical cable. With an unparalleled protection against physical damage without sacrificing flexibility or functionality within fiber networks, 4 core armored cable is a perfect addition to any fiber network in hazardous environments. What is Armored Fiber Cable? This entry was posted in Fiber Optic Cables and tagged 4 core armoured cable, armored fiber cable, armoured cable on December 7, 2017 by Admin.